Now there is a quicker, easier and painless way to promote scar-less healing, increase natural collagen reproduction and reduce fine lines and wrinkles. The DermaPen is a revolution in skin needling that is safer than traditional skin needling rollers and Fractional Lasers. The channels carry up to 80% more topical nutrients, allowing for treatment delivery deep into the skin’s fibroblasts to feed the underlying cells found in the dermis and basal layer, this increases absorption of active ingredients into the skin creates stimulated repair and faster-resurfacing results. There is no chance of cross infection as the device only uses disposable needles. And because damage to your epidermal later is minimized, rejuvenation results are enhanced. Active ingredients can be directly supplied to the deeper layers of the skin for a superiors effects on collagen and elastin rejuvenation. DermaPen® is used, even for hard to reach and delicate places such as around the eyes, nose and lips where fine lines and wrinkles are most visible. Most skin areas can be treated. Popular areas include the face, neck check, hands and abdomen. When Do We Recommend DermaPen? 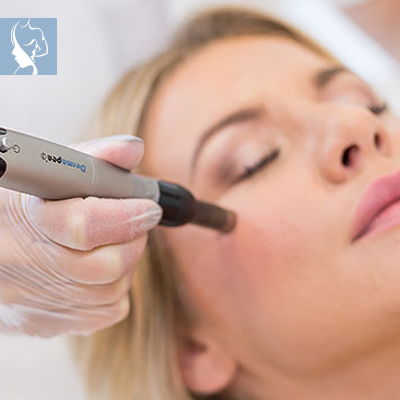 DermaPen® is a perfect solution for a wide range of treatments. It was designed for those who want to have rejuvenated their skin, target the effects of ageing; sun-damaged skin; hyperpigmentation; Rosacea; enlarged pores; scarring and stretch marks. DermaPen® is used for even hard to reach and delicate places such as around the eyes, nose and lips where fine lines and wrinkles are most visible. The vertical delivery makes it easy to penetrate the various skin depths and breaks up scar tissue for improved healing.